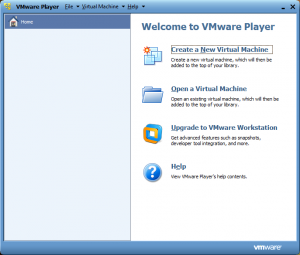 Sadly for this post, but luckily for the rest of us, VMWare have now released version 5 of the Player software. Everything seems to work as before and most functionality appears in the same place, but the screenshots are now out-of-date. I like Windows. I know my way around it, I’ve tried the alternatives and I still like it. The most important part of writing any code is testing it, and it’s hard to test properly on a remote machine. Every change has to be uploaded (over a slow connection) before it can be run. It’s obviously a bad idea to test on a live site, so now we need two remote machines. Now the cost is mounting along with the frustration. Everything’s in the wrong place. The current scripts expected to look in /usr/bin, but this directory didn’t exist. The closest match might be C:\Program Files\, which isn’t the same at all. Shell scripts written for BASH don’t work on cmd.exe. Nothing I could do was going to make them work. These problems aside, testing code in one environment and then deploying to another doesn’t seem like a good idea. I needed access to a UNIX box. The most obvious option one is to install a UNIX system locally and work on that. This sounds fantastic – you edit code and it’s already uploaded! Unfortunately for me this isn’t an option ’cause I like Windows. Luckily I’d heard of virtualisation. 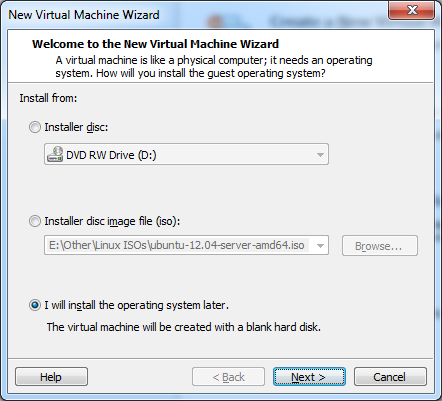 It didn’t take long to start up a Linux virtual machine which ran cleanly within Windows, and here’s how you can do it too. There’s a wide variety of host software for running virtual machines within Windows, and I’d already heard of VirtualBox, VMWare Player and Virtual PC. 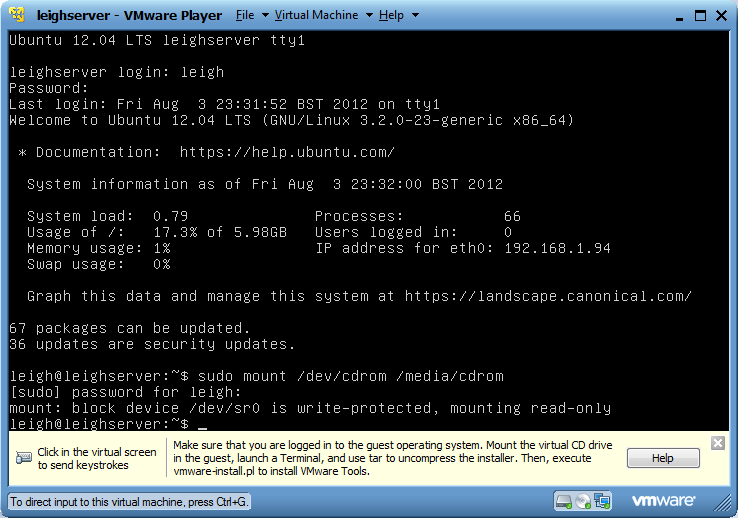 The latter doesn’t officially support Linux guests, and a brief comparison led me to pick VMWare’s Player. 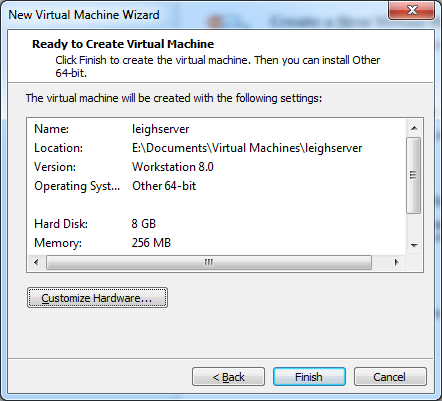 Installing this was very easy, and I soon found myself ready to start creating a virtual machine. 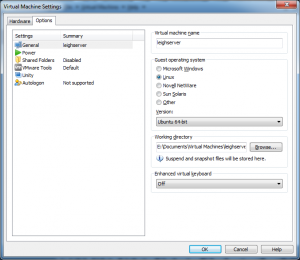 Choosing the option to create the VM starts a wizard to guide you through the settings. 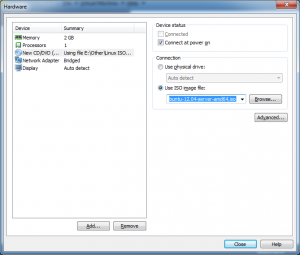 To install an operating system you’d commonly need an installation CD, but the player can cope with .iso image files directly, so burning the physical CD isn’t necessary. I grabbed the latest version of Ubuntu server from their download site and was ready to go. I’m probably over-suspicious, but I tend not to like letting applications help me out with operating system installations, and VMWare Player will jump in and ask you if you want help with the process. The best way to get it out of the way is to avoid telling it what you’re up to. I chose the option to install the operating system later. (I have had experience of things not working right after using the guided installer). Again we keep our intentions secret, avoiding telling the player that we’re installing Linux. 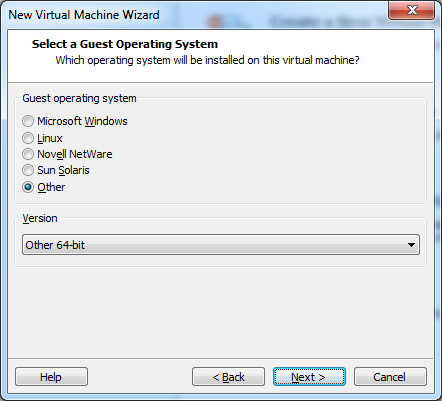 At the end of the wizard, click the “Customize Hardware” button to tweak the VM’s hardware settings. Again I’m probably being over-suspicious, but I think operating systems like an easy life and so my first step was to remove any unnecessary hardware (e.g. USB controllers / printers). Once you’ve done that it’s worth bumping up the available memory to a sensible level, and it’s finally time to tell the player what CD image we want to put in the drive (click to zoom in). I want to set up a webserver and this will expect to be connected to a network in a normal manner. 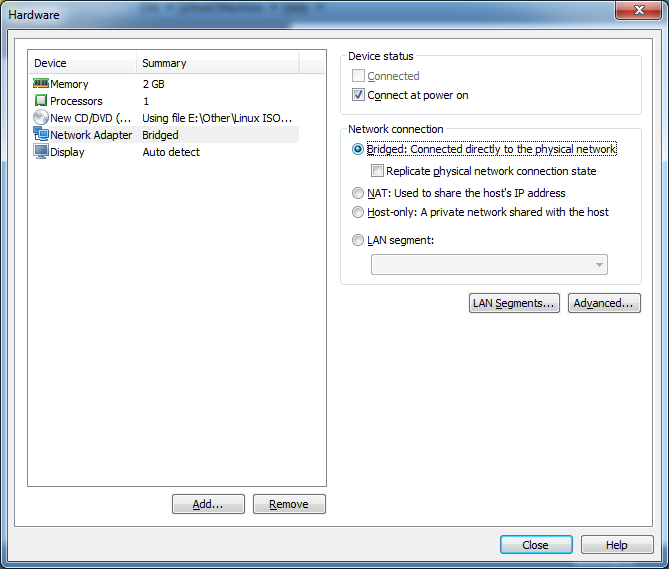 I therefore chose to bridge the host network adapter, allowing the guest operating system to connect directly on to the network. Once you’ve done this you’re ready to boot up. The CD image will be used directly, and the virtual machine will boot into the Ubuntu setup program. 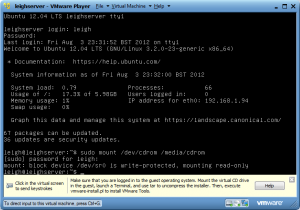 This is fairly easy to work through, and there’s lots of help and support on the Ubuntu website. Towards the end of the process you’ll find an option to automatically install a load of software. My suspicious nature kicked in again and I decided not to bother, opting to install what I wanted manually later. 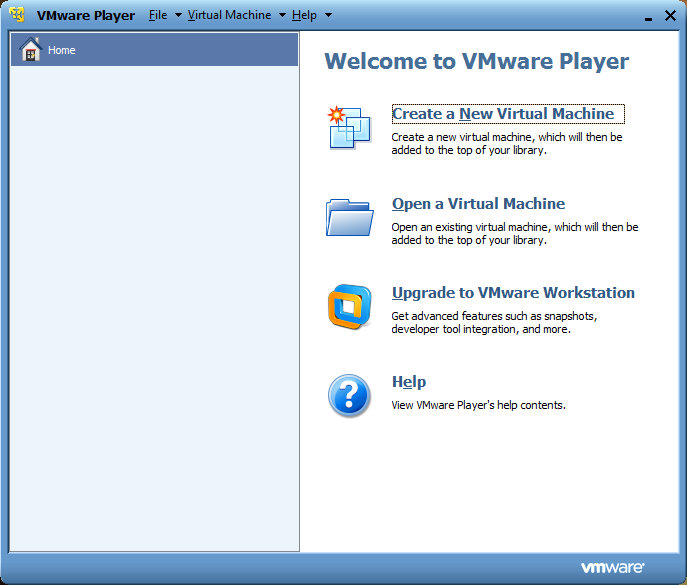 VMWare Player comes with a suite of software (the VMWare Tools) which we’ll need. Hiding the operating system we’re installing kept the process smooth, but prevented the tools installing automatically. 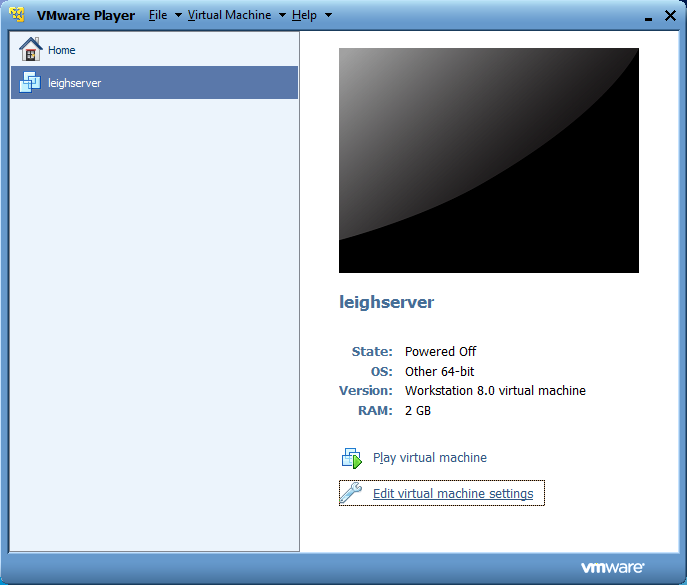 This is easily rectified: first shut down the VM, then run VMWare Player again. 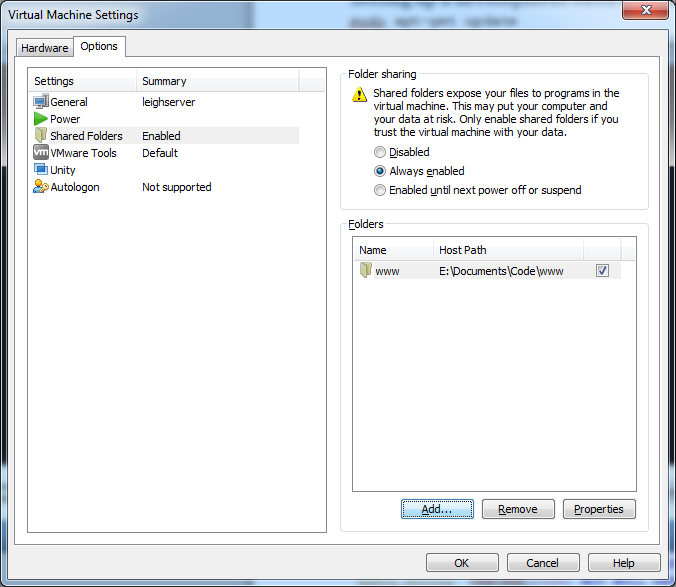 You’ll have an option to edit the virtual machine settings. Choose “Linux” and “Ubuntu 64-bit” (I installed the 64-bit variety of Ubuntu). 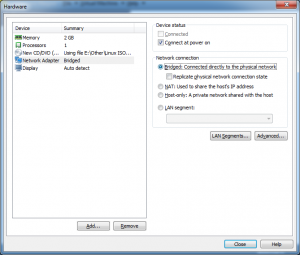 Now the player knows what operating system is running it will offer to install the tools. When the machine reboots you’re ready to install the tools. You may need to change the filenames as version numbers change – use the shell’s tab autocompletion to help with this. You should be able to get by just by selecting all the default options. I’ve had a few problems getting this to work recently, possibly because the latest Ubuntu comes with version 3 of the Linux kernel whereas the tools build “Using kernel 2.6 build system”. Making sure your system is totally up-to-date usually does the trick. We’ve now got an easily-accessible shell, but nothing else. We’ve not got the file sharing which had been one of our original aims. This is easy to fix now the tools are installed. 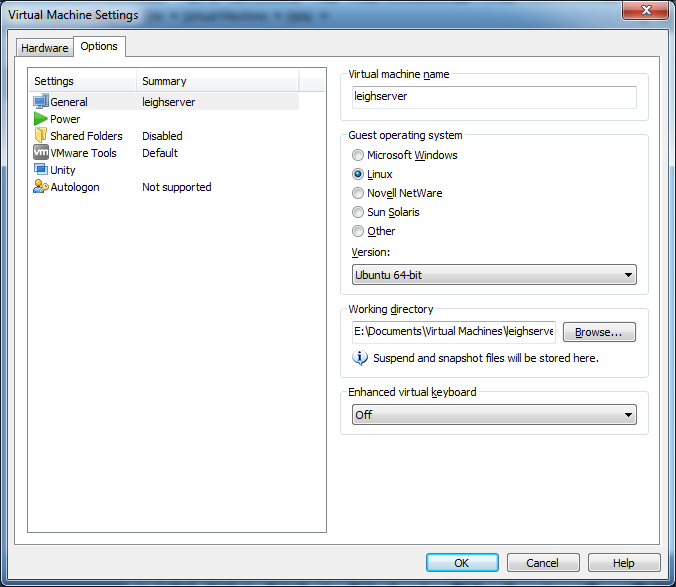 You can get to the Virtual Machine Settings dialog from the Virtual Machine menu even though the VM is still running, and set up a file share. Create a shared folder, and remember its name. I’ve got some web code in E:\Documents\Code\www, and I shared this with the VM. Click OK until you’re back at the shell. 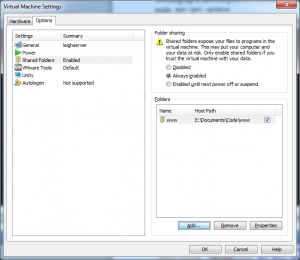 VMWare calls this file sharing the “Host Guest File System”, and puts all shares in /mnt/hgfs. A simple ls /mnt/hgfs/www showed that everything was working properly and the host’s files were showing through. Now we’ve got a Linux server running locally, and I’ve shared files from my host system. I can edit any code from within Windows, and the files will appear immediately on the guest, making it dead easy to debug code. There’s just a few more steps to cover to complete the installation, and we’ll take a look at these next time.